As promised in my last post about home cooking, here’s an easy, healthy recipe that, though it’s meatless, will still satisfy those who are more steak-and-potatoes (as tested on my carnivore husband). This recipe was also a great way to use the chard that's been going strong in our garden since August, even through heat spells, thunderstorms and 22 days of neglect while I was traveling. Pretty amazing plant! The method for making frittatas -- sauteing the ingredients in a skillet; whisking together eggs, cheese, and seasonings; pouring the eggs into the pan to set on the stovetop; then finishing in the oven -- is a great one to master. Once you know the basics, you can create endless variations with ingredients you like. 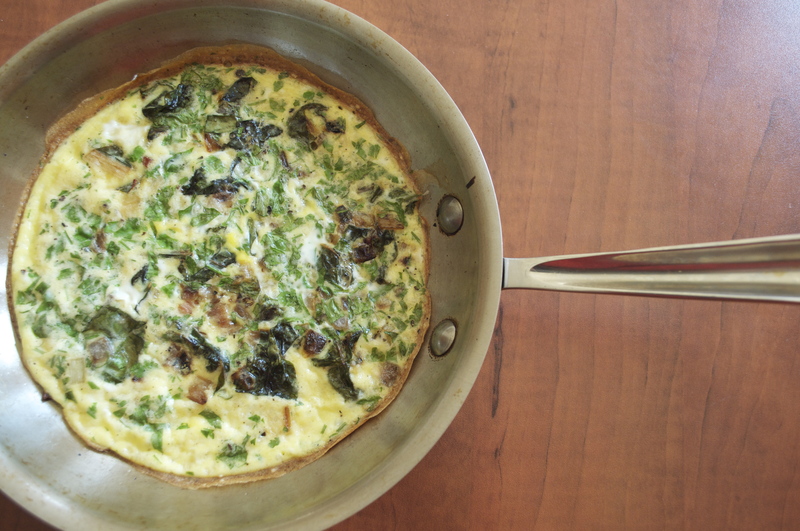 Frittatas are great for simple weeknight meals and lovely for guests for brunch. See notes at the end on other ingredient ideas. Total Time: 30 minutes, not including time to pre-heat oven. Planning Notes: We have an ancient oven -- the door of which my husband just glued back on so it would open -- so it takes forever (35-40 minutes) to pre-heat. Make sure you start pre-heating your oven before you start cooking so it’s ready for the frittata. *Note: I've written the instructions in a time-saving way, where you're chopping ingredients as you cook others, versus chopping everything in advance and then cooking them. The concept of mise en place (or setting up everything in place beforehand) is great if you're a French-trained restaurant chef but not as practical if you're trying to get dinner on the table in 30. 1 -- Preheat oven if you haven’t already. Wash chard and shake off the excess water. Put a skillet (10-inch if you’re making the full recipe for four, 8-inch if you’re making it for two) on medium heat. 2 -- Chop onion and garlic. Trim ends off of chard stems and discard. Slice stems off of leaves; chop stems into 1/2-inch pieces. 3 -- Add olive oil to the skillet; let it heat up for a minute. Add onion and garlic and cook until onion is slightly caramelized, or browned (which adds a yummy sweetness). Add chard stems. 4 -- Slice chard leaves in half lengthwise, then slice cross-wise into 1-inch pieces. Chop the herbs. 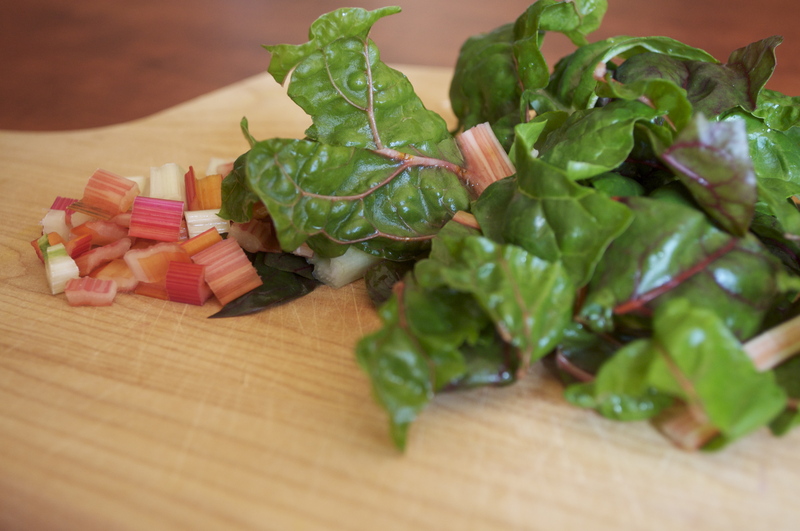 Stir the chard stems once or twice while you’re chopping. Then add the leaves to the skillet. 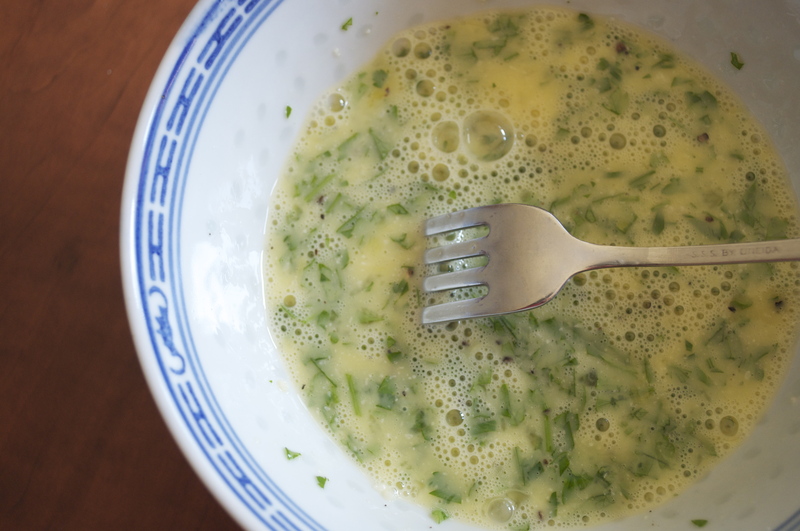 5 -- Whisk together, in a large bowl, the eggs, parmesan, milk, herbs and salt and pepper (you can just use a fork, which is easier to clean than a whisk). 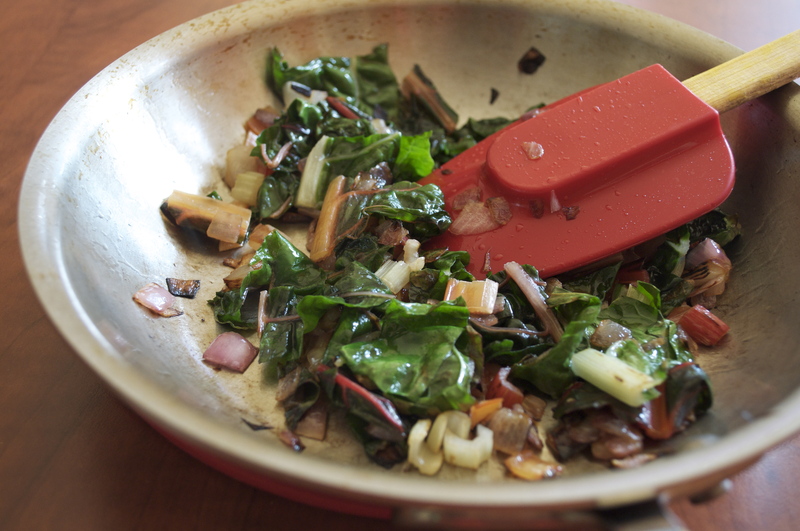 Stir the chard mixture in the skillet once or twice while you’re whisking so the chard doesn’t burn. When the leaves are slightly wilted, sprinkle lightly with salt, then spread the chard and onion mixture into an even layer with your spoon or spatula. 6 -- Pour the egg mixture into the skillet. Lower heat to medium-low; let cook until edges are set, then transfer to the oven. Cook in oven for about 10 minutes, or until center is firm. Slice into wedges and serve with a simple salad of mesclun tossed with a dressing of lemon juice, honey and olive oil, or drizzle the mesclun with olive oil and wine vinegar (personally, I like rice wine vinegar). Mushrooms and herbs, potatoes and leeks, and sausage and peppers would make other tasty combinations. Click here for a list of the top 20 frittatas on AllRecipes' website (I haven't tried them but the list includes interesting ideas). Chard: Chard is pretty easy to grow yourself and does well in a pot. You can harvest the outer leaves and the plant keeps producing new ones, so it lasts a while too. Buy a packet of seeds from any garden store, soak the seeds overnight in water, and follow the directions on planting in the seed packet. Don’t forget to thin the seedlings as they emerge, otherwise the chard won’t have room to grow to a good size for harvesting. Mesclun: Mesclun is one of the easiest and most rewarding things to grow because the seedlings emerge quickly and don't take too long to be big enough to harvest, since you cut them when they're 4-6 inches high. You can cut outer leaves and the inner leaves will keep producing. You can grow it in a pot, so you don’t even need a garden, just a balcony. Buy a packet of mixed mesclun seeds from any garden store, put potting soil into a pot or prepare a patch of soil in your garden, scatter the seeds, cover with a fine sprinkling of soil mixed with a bit of sand, and water. Water when the top two inches of soil are dry. In about 10 days, you’ll see seedlings emerge. Could you imagine trying this recipe? Then share it with others!